One thing I’ve noticed about Nintendo products is that they last a long time. I’m not talking about the timeless aspect of the games, though there is that, too. I’m talking about the products. My old Nintendo 64 still works. So does my copy of Star Fox 64. 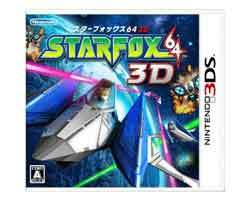 Star Fox 64 3D for the Nintendo 3DS is therefore one of the most redundant video game purchases I could possibly make, but is it a worthwhile purchase? In a nutshell, if you have a working Nintendo 64 with a working Star Fox 64 cartridge, no, actually. If you don’t, though, it might be worth it. If you haven’t played Star Fox 64: you play the character Fox McCloud, pilot and mercenary who leads the elite Star Fox team. You must fly the character through various levels as he attempts to save the Lylat system from the evil scientist Andross. For those of you who haven’t played the first game, don’t expect a deep, meaningful experience, even by video game standards. If you really stop and think about it, the game features a remarkable lack of story through-line of any kind at all, whatsoever. You fly from planet to planet, with no actual explanation about why you are flying there. Despite existing in a vacuum, the characters certainly have a lot to say. This was one of the few N64 games to feature voice acting (a feature still intact), and even if you know nothing more about Star Fox than it exists, you know a rabbit tells you to do a barrel roll in it. If you have played the game before, you can probably speak the dialogue along with the characters. Old players will be happy to know the dialogue has not been touched, other than I believe they did add a few lines to grizzled veteran mercenary pilot Wolf’s utter confusion at the use of a somersault, which totally cracked me up. Star Fox is a space shooter. Most of the levels are on rails, though there are few levels where you can fly freely, plus two tank levels and a really murky submarine level. Most people reading this will already be aware of that, but for the five of you who don’t, now you know. For what it’s worth, Star Fox 64 was a classic of the genre; however, that genre is pretty much dead now, so that might not be worth much. The levels still work fine, because, like the dialogue, their layout is untouched. However, the 3DS is very different to hold in your hand than an N64 controller. The game now has two control schemes. One uses the 3DS’s slider button to fly, which gave me problems. It may be that I just couldn’t adapt, being used to the N64 controls; new players may like it better. The other involves the 3DS’ built in gyroscopes, and is nauseating. I didn’t even have the 3D on. I can’t imagine how that could even work. The one area that has been overhauled is the game’s graphics; the 3DS has obvious power over the N64, and the game does look better. The character designs are the classic look for the team; Fox has been overhauled the most, giving him a slightly cartoonier look than the original. A word on the 3D technology. I turned it off. It works, and it looks nice, but it gives me a headache after about a minute. If you’ve played and loved the original, but no longer have access to it, buy this. If you haven’t played the original, and you have a 3DS, buy it; it’s a still a good game, and what else are you going to buy for the 3DS? If you don’t have a 3DS, definitely not worth buying one for it, though. I don't have a working N64 cart, but I have the VC version on my Wii.